Share an Eclipse Project to GitHub in 2 Steps? If you have a project in your eclipse workspace and you want to share it on GitHub, how to do it? Very simple! Assuming you already registered a GitHub account and you have already installed git on your computer, you can share your eclipse projects to GitHub in 2 easy steps. Note: The following approach works for Mac, Linux, and Windows (assuming you have installed cygwin on your windows). If you use BigBucket instead of Github, it is exactly the same! You can input only repository name, e.g., "face-collage-maker", and leave others as default. On your computer, cd to your project directory in eclipse workspace, and then type the following command lines one by one. The "init" command initiates a new git repository in the project directory. When are done, you need to register the new repository with a remote (where you'll upload -- push -- your files to). In this case, the remote is Github. 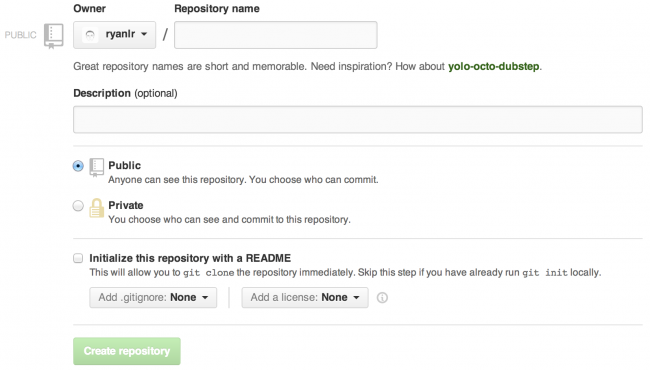 You'll need to get the correct URL for your repository on GitHub. In my case, it is [username] is "ryanlr" and [reponame] is "face-collage-maker". So the URL is "git remote add origin https://github.com/ryanlr/face-collage-maker.git"
Then "git push" to push to repository. If the repository on remote is not empty, you need to do "git pull origin master", before pushing anything. “git add file” or “git commit -a” to commit changes. Then “git push” to push to repository. Before push anything, need to do “git pull origin master”.